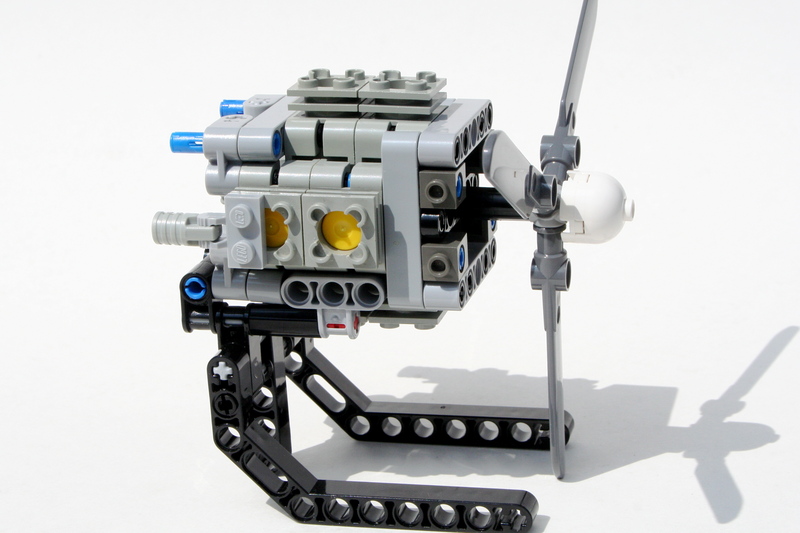 OCTAN is one of my favorite longitudinal themes of LEGO. It gives a little color and identity to many of the racing vehicles that have been produced by LEGO since 1994. I don’t know why it took me so long to start making MOCs with an OCTAN theme, but after last summer’s OCTAN F1, I figured I should do another one. The full gallery including instructions may be seen here. It was time for me to build another airplane, and I figured a0 small air racer would work well in the OCTAN colors. Right from the beginning, I was sure I wanted to make a biplane, and I wanted a radial engine (all real airplanes have propellers). From there everything was on the table. Off to designing. I started with the radial. It’s not quite a radial, but rather two perpendicular boxer 4 cylinder engines. Each bank of two cylinders are mounted in a different direction; up, down, port, and starboard, and are connect by one common crankshaft. The side banks are one stud forward, and the up and down banks rear, so all eight connecting rods can fit on a common 5l axle. Two engine crankshafts are mounted at each end. The motor spins well, and quite quickly, but the connection is not exactly “legal,” as the pins on the cylinders are a little stressed. Working backwards, I attached the leading edges of the wings, and the worked on the landing gear. Being an air racer (even a biplane), it had to have retractable landing gear. 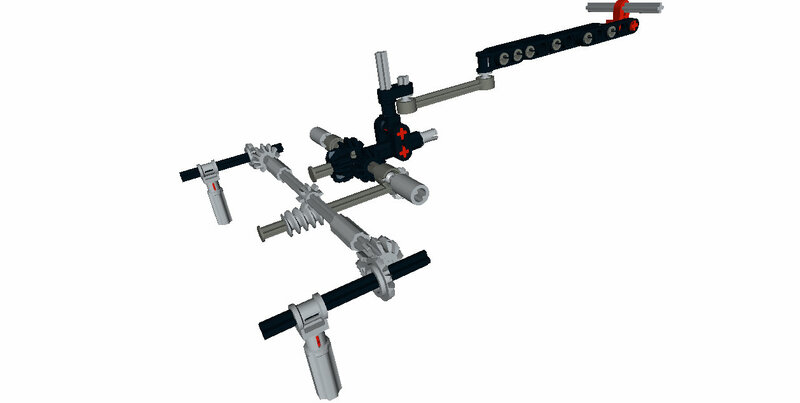 I connected the two wide spaced legs with a simple axle and bevel joint, and added a worm gear to articulate the action. It is a simply solution, and it functions well. Just behind and above the worm gear is the joystick. The roll functions are connected to the bottom wing by gears, and the pitch function is connected by liftarms to the rear elevator. The rudder is fixed. The lower ailerons are connected to the upper ailerons by a simple 9L link. When you move the joystick, all four ailerons move. The cockpit is a little cramped, but when you are racing space is not a concern, only speed. After the radial, the bodywork was the priority for the MOC. I have been slowly acquiring white and green parts over the last year. 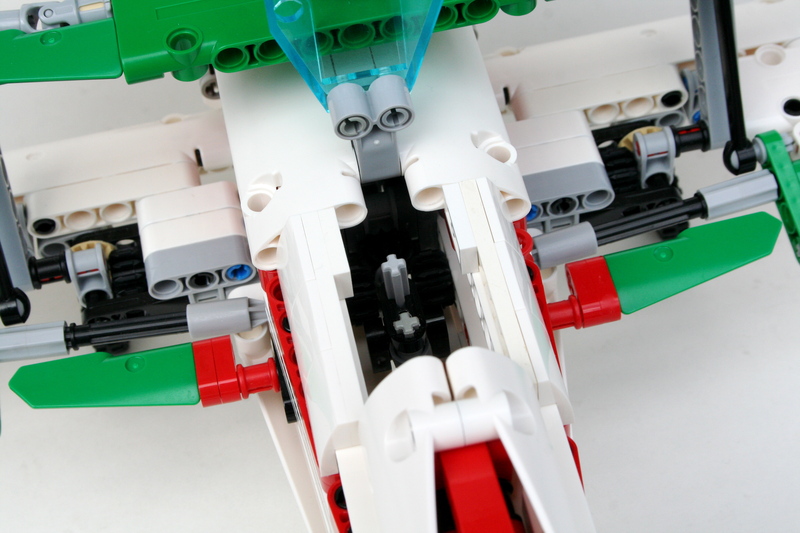 The airplane was designed as primarily white, with red and green accents. The red stripe worked well, as did the red tail, but I could not find a great way to incorporate the green. I added a little to the tips of the wings, and to the wing control surfaces. I used a couple more stickers that I had left over from set 60025, and the MOC was finished. I was pleased with how the MOC turned out. 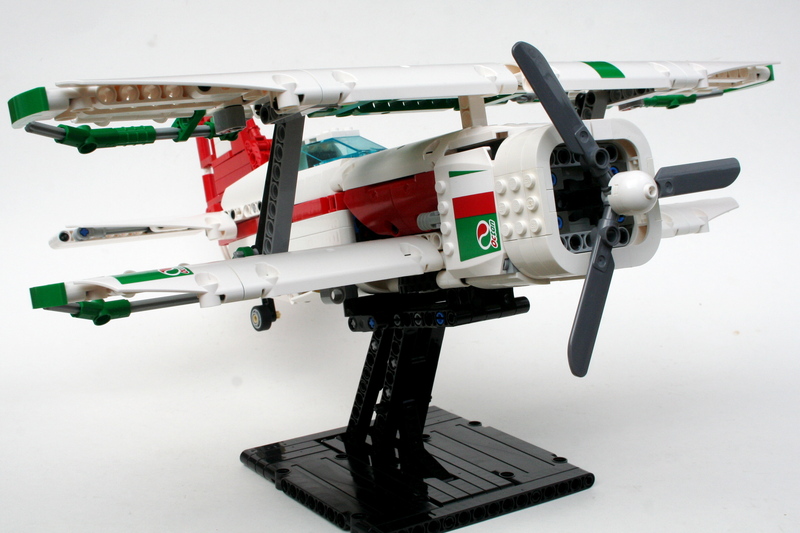 The airplane looks strong, and the red and green make the white vibrant. I wish I could have found a better place to incorporate the green. The places it was added seems a little haphazard. The radial turned out great, but I feel a little bad about the illegal build. The landing gear works well, as do the control surfaces. I was pleased with how it turned out. Next up, maybe an OCTAN speedboat. Other ideas? I start most of my projects because I see something brilliant by another builder, and then I decided to develop this idea, or give the idea little more substance. After discovering a great two row radial, I wanted to give the engine a body. It had also been a long time since I had done a large project. 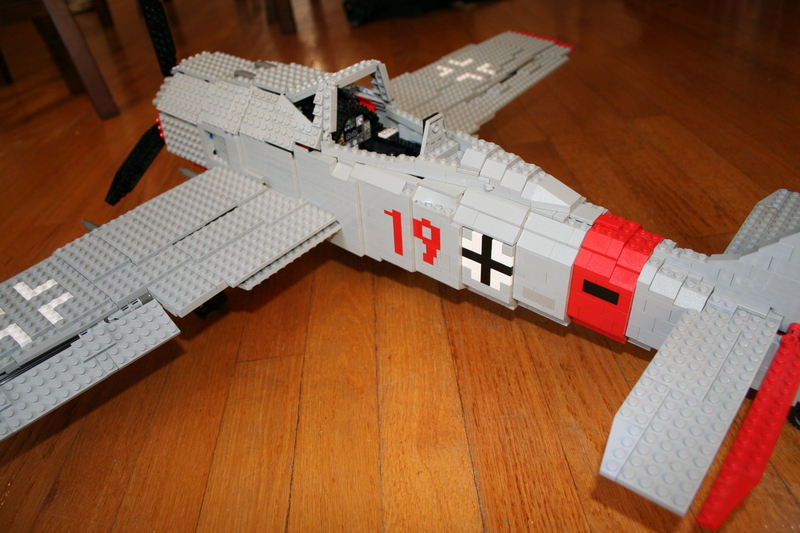 I chose to make the FW-190 for a couple of reasons. First, it had a radial. OK, 14 cylinders in the plane, and mine would only have 12, but it was close enough. Second, it was one of my favorire plane of WWII. Third, the body work would not present too many challenges. I set to work. I had to get the scale right, and start placing some of the plane’s extremities, so I would have a good idea where to place all the parts that I would build. Once everything was placed, I had to figure out how I was going to do all the control surfaces. This started with figuring out the joystick, and the rudders. The joystick was a simple design driving side to side movements out the front by an axle to gears for the ailerons. When the joystick was moved front to back, a link all the way to the rear elevator was activated. I mounted the foot pedals on a simple pivot connected by gears to the rear rudder. Flaps, with a simple activating lever, were also installed. The cockpit was pretty full. With a project this size, it took a great deal of work to get the shaping of the plane to work right. 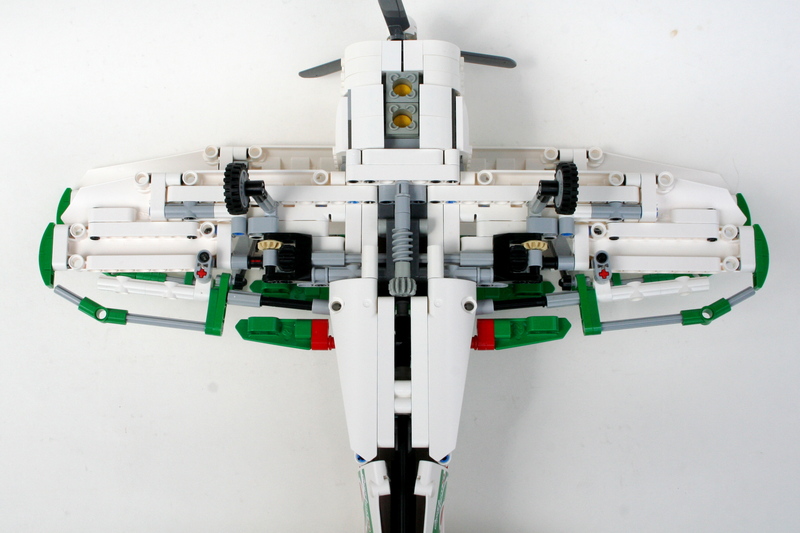 I used half stud offsets to get the fuselage correct, and spent a lot of time on the wings. Because the cockpit had a lot of activating levers, a lot of work went into the area around here. Adding the opening canopy did not help things. I added brick built markings, worked on the coloring, and spent some time adding guns and other details. The model was done. It’s been three years since I have built this plane, but I needed a little motivation to help me with another similar project. It was good for me to remember how much I enjoyed this project, even though it took a lot of time and energy. Stay tuned for the next big plane.